The presence of houseflies on food would be repulsive in most parts of the world because of their association with dirt and rot. But in Uganda, those same houseflies are increasingly turning into saviors, serving as a test of what meat to eat — and what meat to avoid. A growing number of butchers are smearing meat with the toxic preservative formalin. 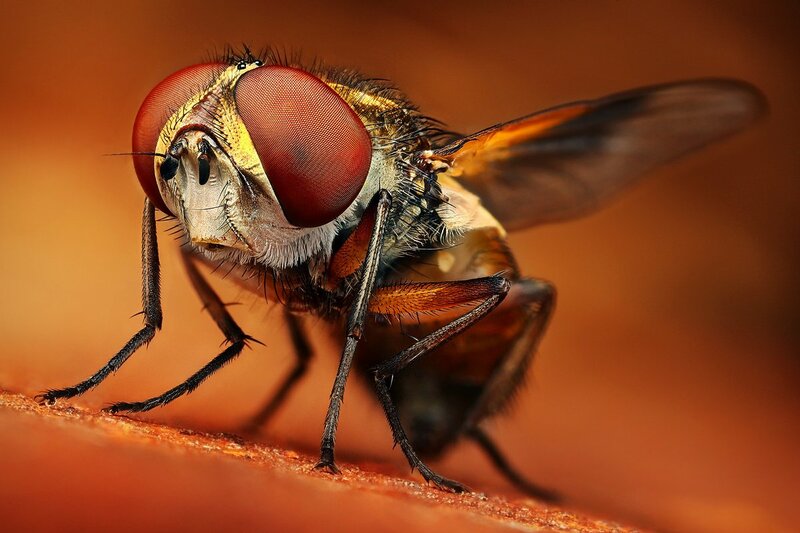 As a result, local food experts and health officers in the East African country are advising consumers to visit only those shops where houseflies hover. A mixture of formaldehyde, methanol and water, formalin is used across the world as a preservative of dead bodies. It also repels houseflies. But a spate of recent investigations in the country has revealed that unscrupulous butchers in Uganda are using formalin to preserve meat. In other parts of the world, the fight against food-borne diseases is increasingly going high-tech, but in Uganda, it’s back to basics. The presence of the otherwise detested houseflies at a butcher shop indicates that the meat is fresh and not contaminated by drugs, authorities are telling buyers, even if other conditions remain less than hygienic. At a time when Uganda’s economy is sagging — the economy has grown at just 4 percent the past five years compared to 7 percent for over a decade previously — houseflies are emerging as Uganda’s most effective tool to tackle what doctors say is a life-threatening menace. “Houseflies swarming on meat is an indicator that such meat is not treated with deadly drugs,” says Stanley Kiyemba, a public health officer in Kampala. Uganda’s turn to houseflies as a sign of safety rather than of filth follows investigations carried out in recent weeks by the Kampala City Council Authority, the Uganda National Bureau of Standards, the police and the Ministry of Health. The tests confirmed that there was formalin in meat sampled from 95 out of 125 butcher shops. In Kampala’s city center, meat sampled from 12 butchers had an average of 15 milligrams of formalin. The levels were 10 milligrams in the suburb of Kireka, 20 milligrams in the neighborhood of Ntinda and 22 milligrams in the Wandegeya area. Those levels were shocking even for seasoned health professionals, says Vivian Nakalika, spokesperson for the Ministry of Health. “It is unfortunate,” she says. “We in the Ministry of Health condemn such acts, and we are cooperating with other authorities to arrest those doing it.” Consuming food preserved with formalin can result in chronic poisoning and can damage kidneys or cause cancer in the long run, Nakalika says. Though new, the practice of treating meat with formalin — and the push to get consumers to welcome the presence of houseflies near butcher shops — is spreading beyond Kampala to other towns and cities, says Godwin Bonge Muhwezi, principal public relations officer of Uganda’s National Bureau of Standards. Traditionally, butchers did not need to worry about preserving meat for long because almost all of it was bought daily, says Abdu Seguya, an abattoir manager in Kampala. But recently, he says, “scarcity of money” has led to butchers looking for ways to stop meat from rotting. Fearing diseases from contaminated meat, some people have abandoned eating meat completely. Simon Osuna, a lawyer in Kampala, says he stopped buying meat in October after learning that formalin was being used by butchers. Still, thousands of people may have already been exposed to health risks by being sold meat treated with formalin, suggest doctors, who are not discounting a possible link with a recent rise in the number of cancer patients in Uganda. “The excessive ingestion of formalin found in the meat being eaten by Ugandans can lead to cancer,” says Philip Katto, a doctor with the Ministry of Health, pointing to worrisome records from the Uganda Cancer Institute, the country’s only cancer referral institute. The number of cancer patients coming to the institute, he says, has increased by 4 percent in just the past year — and has doubled from two years back, when the hospital would receive five or six new cases every day. Now, “every day we get between 10 and 15 new cases of cancer patients of which at least three are children,” says Katto. But even if Ugandan authorities stick to their task, it may be a while before they can eliminate formalin from the country’s butcher shops. Till then, the houseflies are a safer bet for ordinary Ugandans than the government.